How well do you exercise your right to online privacy? Are you a Fort Knox of solitude, a bastion of web strength, and an unbreakable wall of Internet security? Or are you a leaky sieve filled with rotten cabbage? Let’s find out! 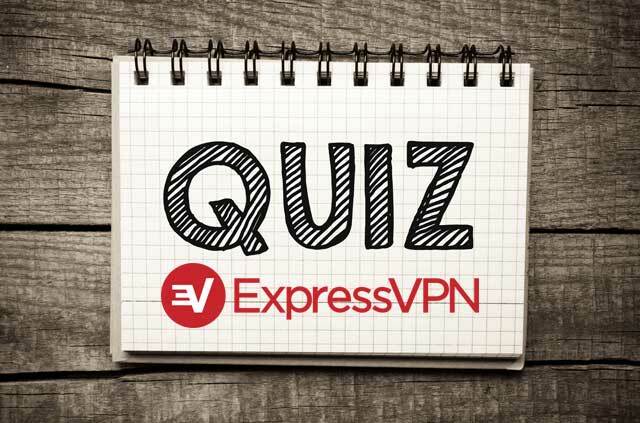 Test your skills with ExpressVPN‘s ultimate privacy quiz. How did you do? Post your heroic celebrations or whimpering commiserations in the comments below. If you failed big time, why not dust yourself down and have another crack at it? Which one of these quotes is attributable to Edward Snowden? "If the American public hadn’t elected Barack Obama, none of this would have been necessary"
"I’m neither traitor nor hero. I’m an American"
"Vladimir Putin serves as a shining reminder to the west of the true value of democracy and freedom"
"MI6 has built an infrastructure that allows it to intercept almost everything"
That’s right! You are magnificent! You thought he said that? Are you even trying? What was the original use of the TOR network? Yes! Superstar! Ironically, the U.S. military invented something that the U.S. government intermittently goes to war with. Nope. Ironically, the U.S. military invented something that the U.S. government intermittently goes to war with. After taking a quiz that appears on your timeline, Facebook knows who your closest friends are. How? Correctamundo! Scared yet? Some companies (including Facebook) use quizzes as a means to harvest user data. Suffice to say, ExpressVPN does not do that. Don’t be silly. Some companies (including Facebook) use quizzes as a means to harvest user data. Suffice to say, ExpressVPN does not do that. Which of the following URL precautions will secure a user’s connection? Use "\" instead of "/". You’re a locked vault. Keep it up. Which of the following should you never perform? That’s right! Replying to a spam email just confirms that the email exists. Not only will the sender continue to spam you, but they’ll likely sell the address to other spammers too. In short, spamageddon. No! You absolutley definitely should do this! The King of Nigeria wants to give you loads of free money but needs your bank account details, social security number, mother’s maiden name, and a wire transfer for $400 before he releases the funds. What do you do? Of course, you should ignore it. The King of Nigeria will almost certainly never want to give you money. That’s right! Cookies were designed so that websites can remember useful user information (such as items added to a shopping cart) or record a user’s browsing activity. They are not necessarily malware, but can be abused. Wrong! Cookies were designed so that websites can remember useful user information (such as items added to a shopping cart) or record a user’s browsing activity. They are not necessarily malware, but can be abused. Adults and children receive the same Internet privacy protections. Right! Children under 13 are afforded extra privacy protections under the Children’s Online Privacy Protection Act (COPPA) of 1998. Wrong. Children under 13 are afforded extra privacy protections under the Children’s Online Privacy Protection Act (COPPA) of 1998. One of Barack Obama’s major plans for education is called ConnectED, which aims to set up classrooms in the U.S. with high-speed Wi-Fi. What percentage of classrooms will be covered, and in which year will it be accomplished? That’s right! A whopping 99%. Did you know ExpressVPN also has an education program? Check out the Future of Privacy Scholarship. Wrong, ConnectED hopes to get 99% of classrooms online by 2018. Did you know ExpressVPN also has an education program? Check out the Future of Privacy Scholarship. Connecting to public Wi-Fi hotspots. All of the above! A VPN is especially important when traveling, as you’ll likely be connecting to a host of strange networks. Sure, you left your worries at home and are currently galavanting around the planet, but that doesn’t mean you should turn your brain off. Always use protection on vacation. Look at the big brain on Ryan! Seriously people, I enjoyed the test (9-11) score, personally Snowden and politics I seemed to miss, only because i must had been focused on something else that was right in front of my eye.s SEROUSLY PLEASE invest towards security from these smart devises, (ioT) My devices know me better than I know my self? Whom is in control of this information if I’m not? Just because someone is not interested in technology as much as you do it does not mean they are unintelligent. They are intelligent elsewhere. Thank you for a useful quiz for anyone. Smart phone, smart tv, smart water, smart device, technology seems to out smart us. All! If one does. Or care about constant offensive spying, tracking, hacking, right to privacy, 4th admendment rights (If one lives in us. ), ect, then that person needs to wake up and see with both eyes! Risking loosing your identity, accounts, credit, money, anomity, +1,000,000,000,000 (zero=infinity) seriously, people WAKE UP, and invest towards offensive and defensive security relating to technology. – I’m new to the world. I am about to Order, a renewal. What a waste of time. Totally targeted towards the unintelligent. ExpressVPN, I hope you realize this is not your exclusive customer base. Looking forward to something insightful and on point. This quiz was akin to reading the back of a cereal box. I got 9/10. Last question was hard.